Wounds that Bind: Exhibition Review - Olaf Breuning, FOS, Dan McCarthy, Peter McDonald, Muller van Severen: 'DON'T WORRY' Kate MacGarry, London till 19th Dec 2015. 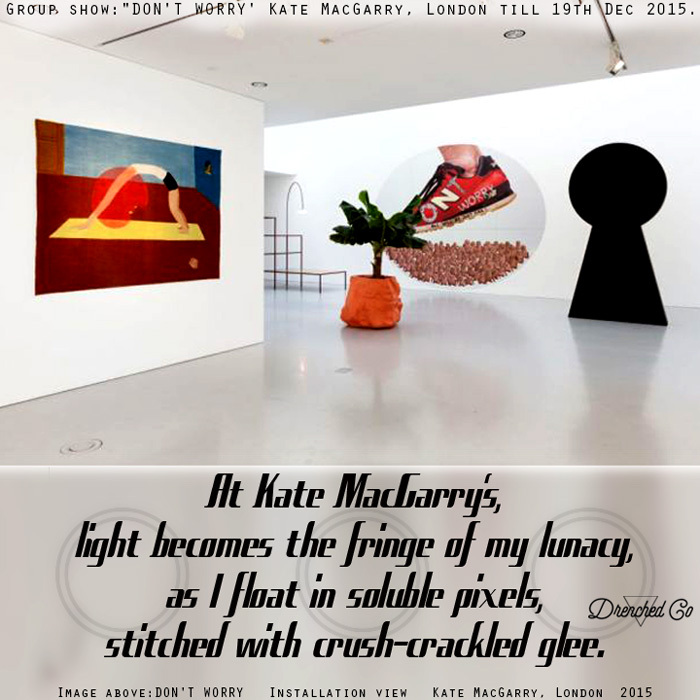 Exhibition Review - Olaf Breuning, FOS, Dan McCarthy, Peter McDonald, Muller van Severen: 'DON'T WORRY' Kate MacGarry, London till 19th Dec 2015. Comment: "I walked into this exhibition to a Camera Obscura. There it was with Olaf bringing in his Brechtian perspectives and FOS his keyhole, and his social fabric through paths, lines and systems. Muller van Severen have their planes, lines and boxes - function with color and light - and Dan offers his petrified memories. Finally, Peter provides the 'film' with his blobs of translucence, ready to fire their first neuron to the light of whimsy and veiled lunacy of the everyday. Hilarious!" - JayZee. Image courtesy of artists and Kate MacGarry, London.